Through hundreds of color photos, the bulk previously unpublished, Images of War: M2 Bradley explores America’s premier Infantry Fighting Vehicle in an unprecedented level of detail. Go inside and out the modern-day icon, then ride it into battle through they myriad of photos presented in this book. See why Bradley remains one of the most formidable armored combat vehicles of its class, even… as it logs over 35 years of service.The Bradley Fighting Vehicle, made famous through extensive media coverage of the wars in Iraq and Afghanistan, is given an in-depth examination in this brand new volume. Drawing on the lessons learned in Vietnam, the Bradley was built to provide a highly mobile platform from which infantry could be inserted into the battlefield, and from which the infantry could operate. Its use soon expanded to that of a scout vehicle with anti-tank capability. Despite initial criticism from Congress, the Bradley proved itself very capable on the battlefield, destroying more Iraqi armored vehicles than did the famed Abrams tanks. 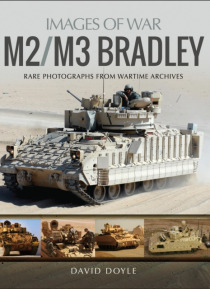 Through extensive photo coverage, most never before published, this book explores the many variations of the Bradley, including the heavily armed M270 Multiple Launch Rocket System.